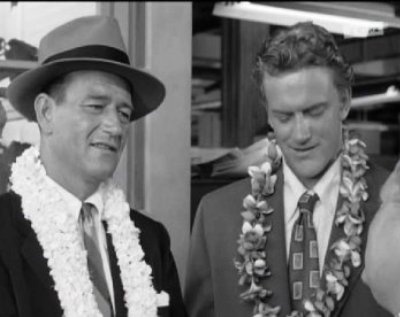 BIG JIM McLAIN—-“He’s a Go-Get-‘Em Guy for the U.S.A. on a Treason Trail That Leads Half-a-World Away!” Those lousy Commie rats and their turncoat stooges are in Hawaii; probably poisoning pineapples and sniping at surfers–you know they would. What to do? Well, if you’re an anointed member of the venerated House Un-American Activities Committee you might send over Two Big Guys with fast fists. 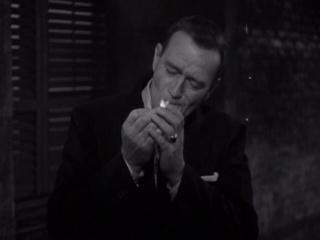 Forget the International Communist Conspiracy, Duke, it’s the National Tobacco Producers that’ll really hurt ya. Yeah, like John Wayne and James Arness, by God–let the Reds tackle these bruisers. Dullish production, sensationalistic scripting, gung-ho acting, hopelessly one-sided flagwaving. What a gas, what a joke. If you can’t stand Wayne, you’ll love this item. 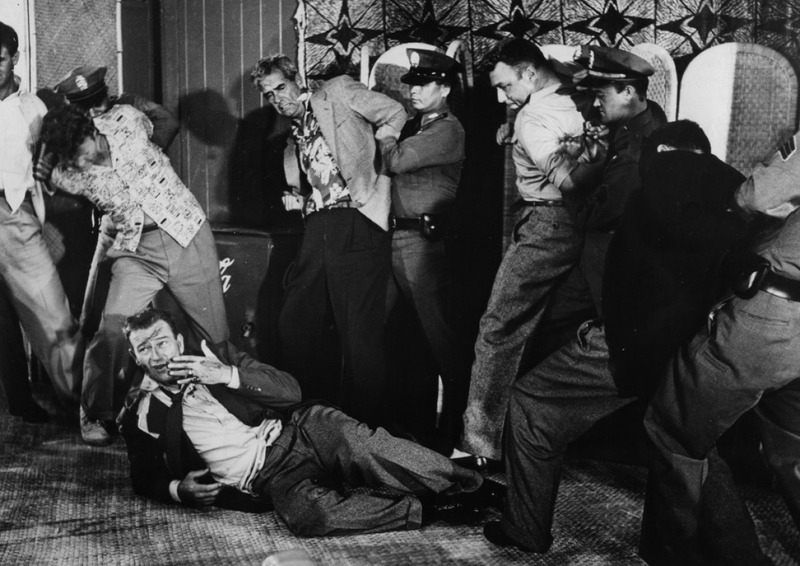 If you’ll defend the Duke to the death, you’ll alternate between chuckles and yawns. The Communists are represented by jerks in general, ‘suspect intellectuals’ ,including a biologist, a labor relations counsel, a psychiatrist and a labor leader. 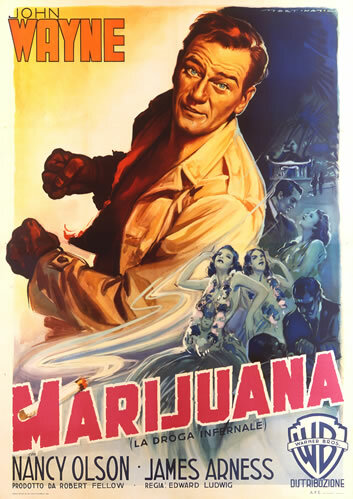 In Italy, where American influence (make that extortion) had already raised hell with politics, the title was changed to Marijuana, and the soundtrack was dubbed to make it look like Hondo & Matt Dillon were after drug smugglers. 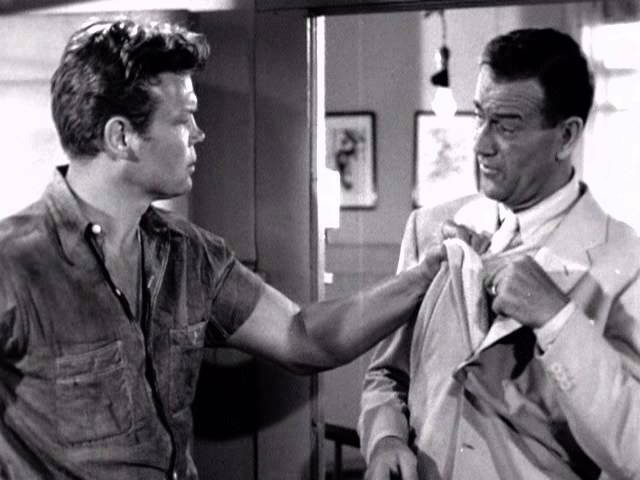 Hal Baylor asking for a knuckle sandwich. The sincere idiocy made $2,600,000 in 1952, despite bad reviews including one which opined “how many loyal Americans have converted to communism out of embarrassment that their country could produce” a turkey like this. Directed by Edward Ludwig (no relation to Ludwig Von Drake), running 90 minutes, with Nancy Olson, Alan Napier, Hans Conreid, Veda Ann Borg, Hal Baylor, Gordon Jones. Filmed on location in Hawaii.